Oz came into the sanctuary after his mother was violently poached in front of him in the Kruger National Park in July 2015. 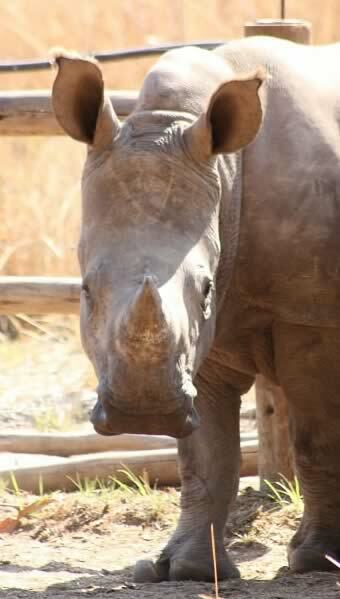 He was brought to Care for Wild Rhino Sanctuary by the Kruger vets and arrived in good condition. He was not dehydrated as is usually the case with traumatized baby rhinos. He took to the milk bottle easily and began to adapt to his new life at the sanctuary. Oz was introduced to Warren (a baby rhino that needed care who was sent to the sanctuary by his owners) and Don and the three baby rhinos became very close friends. They were in the “ICU” because all of them were still small and needed to be watched over. In this enclosure, they bonded and were constantly by one another’s side. In the midday heat, Oz wanted to lie very close to his new friends in the shade. All of us at Care For Wild Rhino Sanctuary know it is not easy to weigh Oz at all.